Just a quickie today. A look at the second ending of the first series of Sailor Moon, the rather rubbish (in my humble opinion) Princess Moon. Lacking the stylish flair of the openings, the bittersweet romance of the first ending, Heart Moving and well as any sort appreciable music, this rotating preening silhouette really is sub-par for the show. I don’t hate the song Princess Moon. It’s fine enough, jabbering on about merry-go-rounds and how nice it is to be royalty and whatnot. It’s certainly not offensive to the ears. 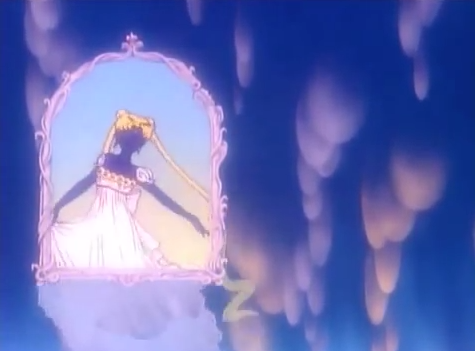 On the other hand, it’s such a tepid that it’s quite out of place in the second half of Sailor Moon series 1. Heart Moving reflected the asthetic quality of the show – it had a mysterious, fantastical quality that served well as a capstone to every episode. Considering the distinctively dark way that the first season wraps up with, it’s a pain to have Princess Moon shoved in at the end – it’s a pathos-breaker. Even though I’ve seen it a thousand times before, while rewatching the series for this blog, I would actually leave the Heart Moving ending on, just because I like it so much. Princess Moon got skipped. Every. Time. It’s the silhouette, I’m afraid. It looks bizarre, as if Princess Serenity waltzed into a 1920’s golliwog party. I’m not claiming that it’s racist, merely rather silly, and an eye-sore. Her movements, too, are ridiculous, twirling like some preening self-obsessed starlet in front of a mirror. It’s not too far off the character of Usagi whenever she’s dressed up, to be honest, but I’m not fond of it. It’s repetitive and uninteresting. For me, the biggest crime about this ending is that it arrives in the series at episode 27, quite a number of episodes before the Big Reveal over who the Moon Princess is takes place in the show. It’s absurd, I realise, that no one would have figure out this plot twist – they pretty much overtly express it in Mamoru’s dreams throughout the series – but it would have been nice to let the narrative perform the reveal, rather than spelling it out in a sub-par sequence. I’m only being cruel to poor, twirling Princess Moon because of how much I love the show, and the high standards I’ve come to expect from the creators. Thankfully, the next ending sequence (Otome no Policy), commencing in season 2, and continues far into season 3 if I recall correctly, is just bloody fantastic stuff both musically and aesthetically, and I’ll be gushing about that in the near future. I beg you to disagree. Leave a comment if you, like all the YouTube comments in the embedded video above, absolutely love this song and animation sequence.